As far as dinner is concerned, there are few things more comforting than a high-quality steak, generously seasoned and cooked to absolute perfection. Though when eating out, the choice of ordering a steak is generally considered boring, and generally best left to the most unadventurous of diners. When reviewing restaurants, dishes that sound either ridiculously enthusing, or those that seem just plain ridiculous are generally encouraged – and when fraught with so much choice, steak can be very rarely placed into either category, especially considering the fact that it’s often cooked so carelessly. Besides, why would I (or anybody) consistently order something that’s so simple to cook well at home, and for less than a quarter of the general restaurant mark-up? On the other hand, when visiting restaurants that focus primarily on steak, it would seem incongruous to overlook the kitchen’s main focus, especially when an “old school” butcher’s at the front of the building is on hand to supply the produce. Since the turn of the century, an uncountable number of high-end steakhouses have opened their doors in London, though few are quite like Macellaio RC. With another outpost in South Kensington, Macellaio RC (‘Macellaio’ literally meaning ‘Butcher’ in Italian) is Roberto Costa’s concept-driven Italian restaurant, focussing heavily on luxurious Italian Fassona beef and controversial Bluefin tuna. Situated within a former butchery, the latest branch is on Exmouth Market, and has a prominent exterior with two large window displays: one showcases a macabre scene of hooks that dangle colossal slabs of beef, while an enormous silver tuna takes the other window’s focus. Inside, the space is also a far cry from the quaint trattorias generally associated with authentic Italian cooking. After passing the butchery, the main focus of the understated dining area is the bare wooden tables, each brandishing more holes than a dart board. We later discover that these are caused by the theatrical arrival of razor sharp steak knives, zealously flung into the table tops. The extensive wine list is also worth mentioning, with various bottles on display adjacent to the bar, interestingly offering unique pairings depending on how the steaks are cooked, from ‘Blue to Burnt’. Choosing a selection from the both sides of menu that’s split down the middle between beef and tuna, ‘the cows of the sea’, four Bollito croquettes (Roman meatballs) were breaded and fried, but provided a dry and a forgettable start to the meal. Next, carpaccio of beef (£5.50) comprised paper thin slivers of raw fillet, simply accompanied by a generous pinch of salt and a drizzle of peppery olive oil, preventing the flavour of the beef from being overpowered. The tuna carpaccio (£8) also featured thin slivers of raw flesh, yet this was topped with a handful of the sweetest cherry tomatoes I’ve sampled outside of Italy. As is the case with so many Italian restaurants, both carpaccios were simple and beautifully executed, with a prominent focus on quality ingredients. Steak tartare (£6), alas, incorporated a whole store cupboard’s worth of ingredients, most of which were completely unnecessary and unidentifiable. Dice of raw beef were teamed with capers, anchovies, gherkins, onion, Worcester sauce, Tabasco, tomato ketchup, mustard, salt, pepper, and brandy, yet the only flavours to shine through within the mix were the sweetness of ketchup and the alcoholic potency of brandy. Next, the mains managed to test the kitchen’s cooking skills a little further, choosing one steak from each side of the menu. A huge slab of beef sirloin (£22 for 400g) arrived at the table, having been cooked perfectly medium-rare with an outer caramelised bark and fat that had been rendered just enough to lose chewiness, but without sacrificing too much of the flavour. 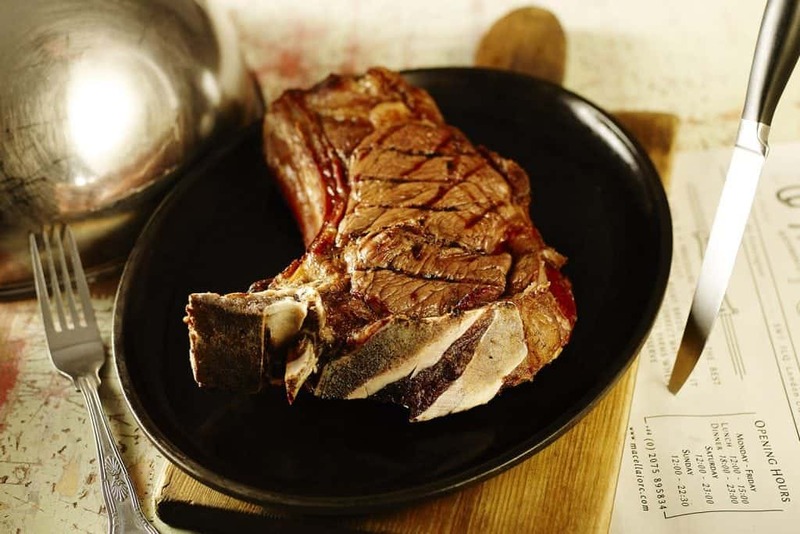 The heavily marbled meat, dry aged for around 35 days, was then sliced into bite sized chunks and served at the table alongside the bone, to be savagely gnawed upon once the rest of the meat has disappeared. Delivering the strangely pleasing smell of dry-aged meat, alongside the rich taste of marbled fat, this steak is far too good to share, and is some of the best ever to have passed my lips. What’s more, the one-week aged tuna steak was also remarkable, having been seared for a matter of seconds in order to retain a magenta hue running throughout. The tuna was so good, in fact, that it almost made the chopping board that this and the carpaccios had been served on seem forgivable. A dessert platter of cheesecake and an outrageously decadent chocolate cake were fine, but it was the latte dolce fritto (£6) that really stood out – a dish of sweet milk-based cream that’s lightly breaded and fried to result in fritters of extraordinary sweet/savoury balance. For the most part, the food at Macellaio RC is very good, and is reasonably priced – especially when considering the prominent focus on produce quality. There’s also a remarkable level of care demonstrated here, from the in-house butchery to the the staff’s profound knowledge of ingredients: a level of care that’s seldom found within the rest of the city’s premiere steakhouses. Macellaio RC can be found at 38-40A Exmouth Market, London, EC1R 4QE.